It's not often that an all female bout can headline a show but this week we see that happening several times. The particular poster is for the amazingly promising match up between Naoka Yamaguchi and Naoka Fujioka, a bout which sees Yamaguchi putting her WBA Super Flyweight title on the line against the unbeaten Fujioka. The bout, put on by Shirai-Gushiken Gym is the main event of a 8 fight show which also feature support bouts involving Taiki Eto and Shingo Eto, the brothers of Koki Eto, the reigning WBA interim Flyweight champion. The show, dubbed the "The Kanmuriwashi Fight vol.47", has a pretty basic poster but one that is effective with the two fighters being very visible and very clear to see. The poster above is for the Shirai-Gushiken promoted card for July 22nd. 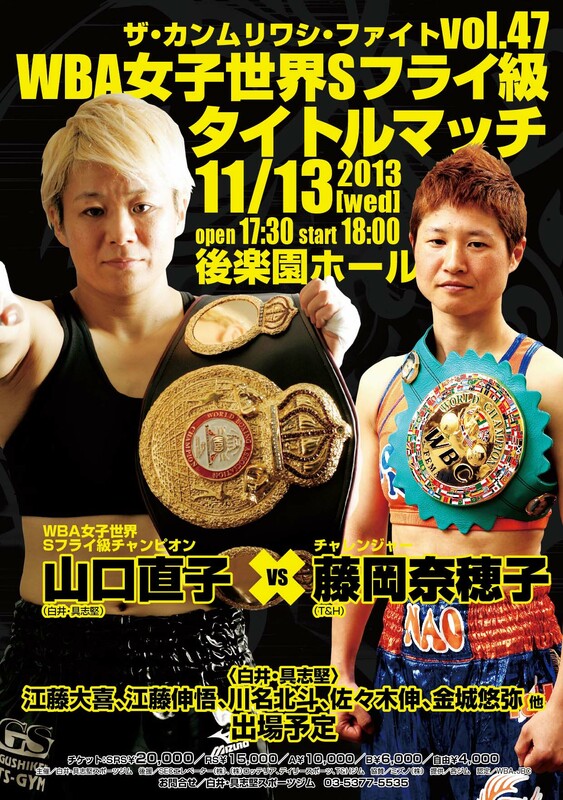 This poster features WBA female Super Flyweight champion Naoko Yamaguchi as the prominent figure whilst her challenger Daniela Romina Bermudez takes a small, inset picture.